How did everything work this year? This is one of my favorite times of year. It’s not the cool temperatures, the fall colors, or even the fall migrations of birds and insects coming through. Instead, I like this time of year because it’s time to figure out how this year’s prairie management worked and start planning for next year. Closing that adaptive management loop (gleaning lessons from one field season and applying them to the next) is really fulfilling for me. I get to learn something and then put it right to use. The only downside is waiting another year to see how things turn out again! This northern bobwhite was calling from a fence post along the edge of our prairie earlier this summer. 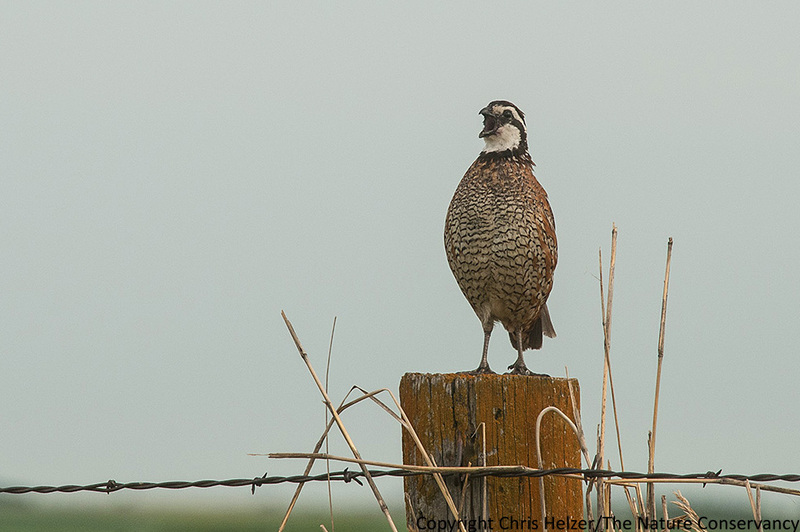 Bobwhite are abundant in our prairie, probably because of the wide variety of habitat types available. Earlier this week, I walked through our family prairie and tried to capture the results of 2015. I wasn’t collecting data. Instead, I took a few photos, wrote a few notes, and looked back at some photos and notes from earlier in the season. I mainly tried to measure what I saw against the basic habitat objectives we have for our prairie. 1) HABITAT HETEROGENEITY. Provide patches of habitat that cover the spectrum from short/sparse to tall/dense vegetation, with areas of mixed-height structure in between. 2) PLANT DIVERSITY. Increase plant diversity over time by allowing all plant species a chance to bloom and reproduce every few years, and periodically suppressing grass dominance to allow wildflowers a chance to maintain or expand their “territories”. In general, I was pretty happy with what I saw this week. There was definitely a wide range of habitat structure across the prairie. We began the season by grazing most of the prairie pretty hard to knock back the vigor of smooth brome. After that, we put the cattle into about 1/4 of the prairie for the month of June and then gradually gave them access to more of the prairie as the season progressed until they were grazing about 3/4 of the site by September. This photo from earlier this week shows the contrast between the area in the foreground that hasn’t been grazed since May and the background where cattle have been grazing since late July. Some of the areas opened up to grazing late in the season weren’t grazed very hard because the grass was pretty mature by the time cattle came in. However, the cattle did graze in patches, and also knocked down the vegetation as they walked around – altering the habitat and making it easier for both wildlife and people to walk through. The grasses in the 1/4 of the prairie we grazed in June stayed short all season, and many of the wildflowers were also cropped off. However, some of those wildflowers had a chance to grow back as we spread the cattle out across a larger area and they became more selective about what they ate. Other plants went ungrazed, or only lightly grazed, all season. 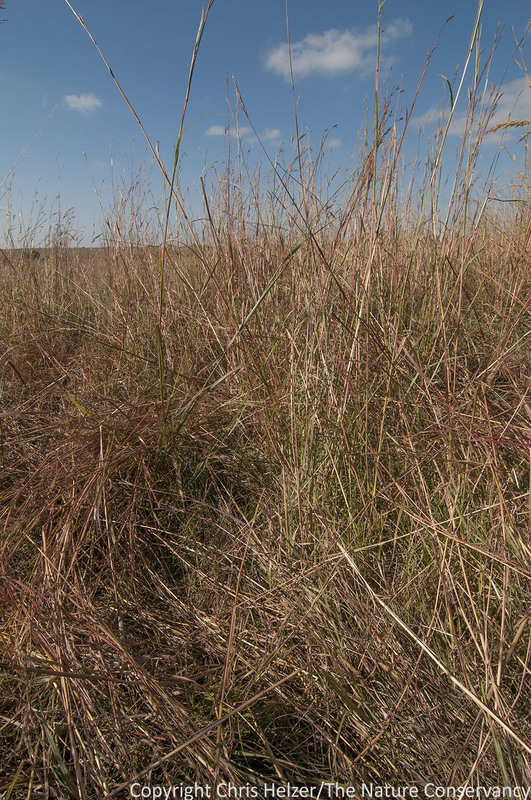 As a result, the habitat structure was a mixture of short grasses and medium to tall forbs. In July, I found a family of upland sandpipers feeding in that part of the prairie – their still-flightless chick searched for insects in the short grass while staying near the protective cover of the taller forbs. 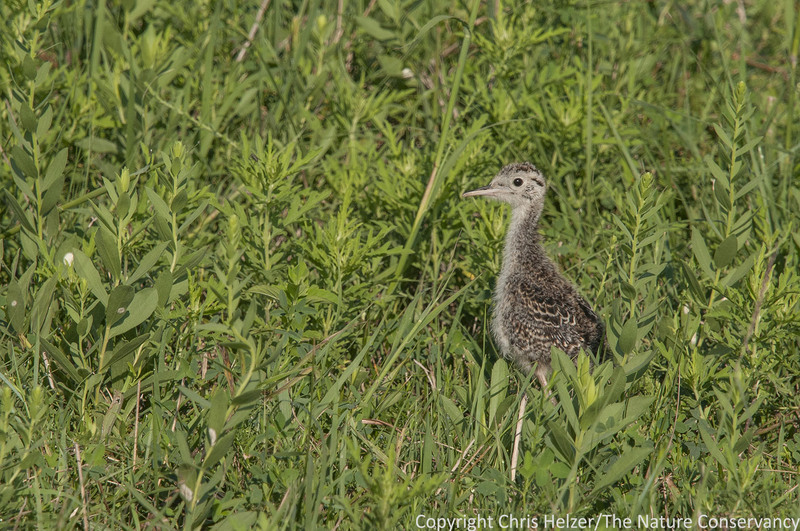 This young upland sandpiper and its parents were enjoying a part of the prairie where cattle had been grazing most of the season, keeping grasses short but allowing some forbs to grow tall. The chick could feed in the open but remain close to protective cover. Elsewhere in the prairie, the height and density of the vegetation varied by how much grazing pressure it received. Areas that were rested much of the year were dominated by tall warm-season grasses, while areas grazed from July through September had much shorter vegetation. Despite the fact that we’re still trying to boost plant diversity across the site (which consists of small prairie remnants surrounded by former cropland planted to grasses by my grandfather in the early 1960’s) there were good numbers of wildflowers blooming through the whole season. In the more intensively-grazed portions, only a few species such as hoary vervain (Verbena stricta), ironweed (Vernonia baldwinii), goldenrods (Solidago sp. ), native thistles (Cirsium sp. ), and other species panned by cattle were flowering. However, there were many other wildflowers blooming across the rest of the site, including purple prairie clover (Dalea purpurea), leadplant (Amorpha canescens), stiff sunflower (Helianthus pauciflorus), several milkweed species (Asclepias sp. ), and many others. 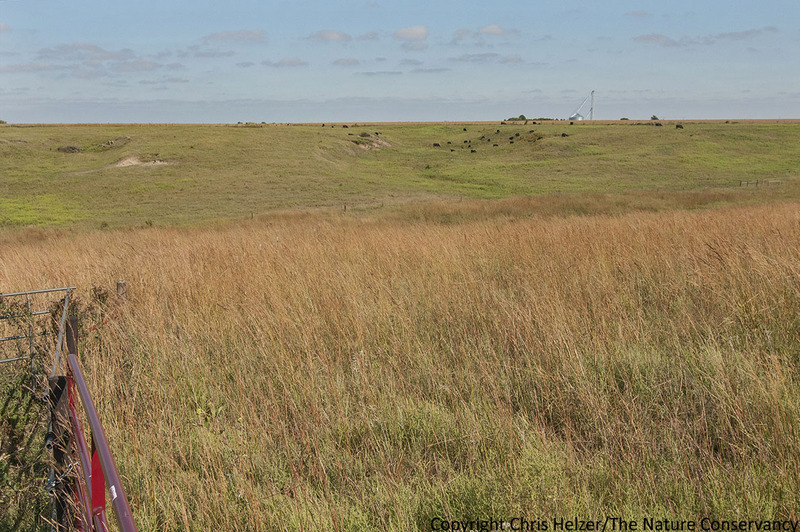 The most abundant wildflowers were found in the portions of the prairie the cattle had grazed intensively in 2014 – grass vigor was still suppressed in those areas, allowing both “weedy” and “non-weedy” forbs to flourish. Regal fritillaries and other butterflies are common in our prairie. I photographed this one a few years ago as it was feeding on common milkweed in part of the prairie was only lightly grazed that year. During 2015, just about any animal species should have been able to find what they needed in our 100 acre prairie. 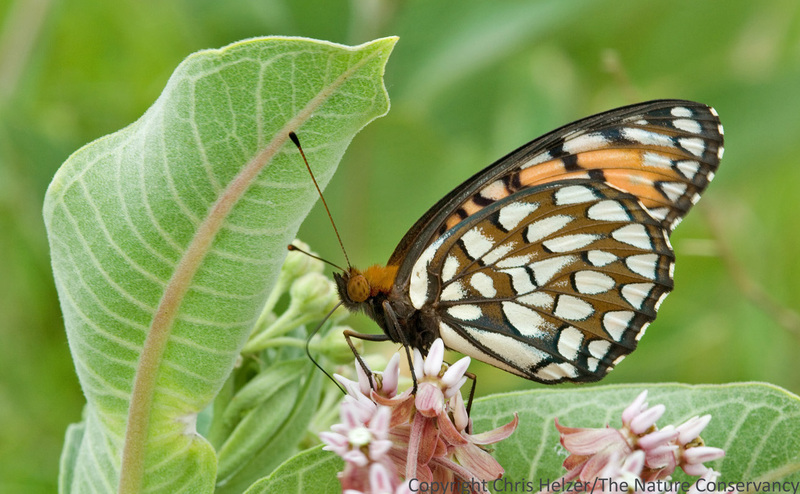 Regal fritillaries had violets for their caterpillars and monarch butterflies had milkweed for theirs – and both found abundant nectar plants, including in the most intensively-grazed areas. The varied vegetation structure supported a wide range of grassland nesting birds, including grasshopper sparrows, upland sandpipers, western meadowlarks, northern bobwhites, dickcissels, sedge wrens, and others. Small mammal trails were abundant, as were burrows of the badgers and coyotes that hunt those mice, voles, and ground squirrels. Best of all, there were myriad bees, grasshoppers, katydids, prairie cicadas, spiders, and countless other invertebrates doing their jobs to support and nourish the plant and wildlife communities. I haven’t yet worked out all the details of next year’s management plans, but I know a few things. The portions of the prairie that were grazed hardest this year will be rested for most or all of next season. We’ll likely bump the cattle stocking rate up a little because of this year’s abundant rainfall and strong grass growth. I’ll try to make sure cattle have early summer access to the areas where I saw lots of first-year sweet clover plants this year – grazing those areas will greatly reduce flowering and seed production. Finally, I’m thinking about letting the cattle stomp around for a week or two in one of the wet areas they’re normally excluded from because the vegetation is getting excessively thick there. I’ll meet with my grazing lessee (the guy who owns the cattle) in late fall or early winter. Between now and then, I’ll likely change my mind several times about some of my plans and come up with some new ones. Next season we’ll make adjustments on the fly as we see what happens with rainfall, grazing behavior, invasive species, and all the other factors that influence management decisions. Then, about this time next year, I’ll be walking around the prairie, trying to interpret the results of all those ideas and adjustments. …and I’ll be having just as much fun as I am now.